When the first trailer for Amazon Prime’s new series, “Jack Ryan,” dropped, it looked practically antiquated. It appeared to be a newer version of “Homeland,” the gritty thriller that took a serious look at international relations and CIA spy work. But whereas “Homeland,” came out against the backdrop of the Osama Bin Laden assassination, “Jack Ryan” had the misfortune of being released during a depressing and embarrassing time for the United States’ international pedigree. “Homeland” came out at a time when the zeitgeist would be increasingly compelled by the war on terror; “Jack Ryan,” was released when nobody wants anything to do with the U.S. government. It’s a refreshing surprise, then, that “Jack Ryan,” takes a surprisingly nuanced approach to its subject matter. Rather than paint a picture of the United States government as the ultimate hero, it never flinches away from its cruelty, specifically the use of torture and bombings that affect both high-level threats and innocent civilians. The show begins not with the origins of its titular hero, but two young Middle-Eastern children watching their surroundings being bombed by (presumably) U.S. military bombers. Yet, for all its political savvy, the show suffers from a total failure to develop its characters beyond simple clichés. But I’m getting ahead of myself. 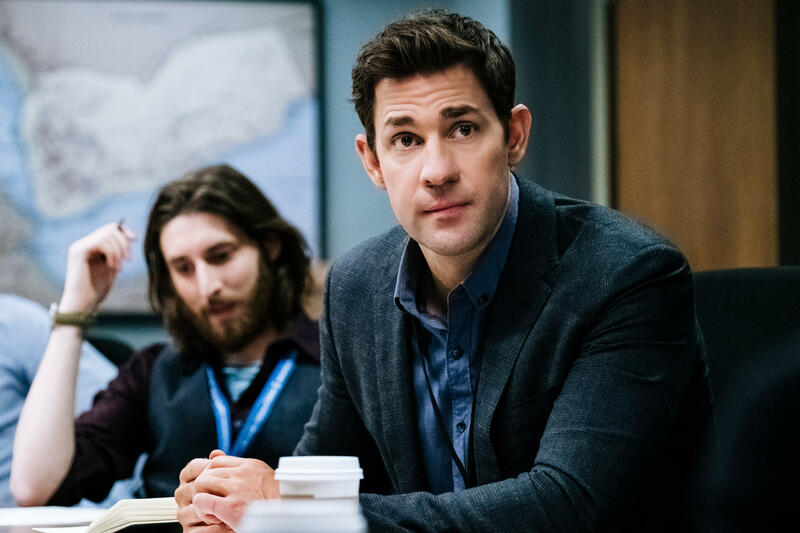 The show follows Jack Ryan (John Krasinski, of “The Office” fame), an Economics Ph.D. and military veteran working for the CIA. He butts heads with his new boss, James Greer (Wendell Pierce) over potential evidence of a new terrorist threat, a man who goes by the name of Suleiman (Ali Suliman). Over the course of the first two episodes, the show cuts back and forth between Ryan and Greer’s investigation of Suleiman, as well as exploring the antagonist’s backstory. In its finest moments, “Jack Ryan” serves up subtle critiques of the United States’ use of force and torture, as well as some excellent action sequences. In the first episode, Greer and Ryan travel to a military base in Yemen to interrogate two men connected with Suleiman. Ryan’s discomfort with the sounds of prisoners crying out in pain reflects our discomfort; he gets intel out of one prisoner not through torture, but by breaking bread with him. Similarly, during some tense and explosive action sequences, the camera never shies away from the civilians fleeing the fire fights. That’s not to say that “Ryan” is somehow “pro-terrorist:” the show, too, focuses on how innocent women and children are coerced into horrific situations. Yet, while the shows politics are refreshingly nuanced, its characters are anything but. Nobody gets developed beyond flat clichés. Ryan, for example, is little more than a “guy with a hunch.” The show hints at his PTSD but doesn’t explore it further. Similarly, Greer is little more than a guy with a bad temper, who swears a lot and complains about his divorce-in-progress. It remains to be seen whether or not these characters will be fleshed out further; as it stands, there isn’t much reason to be invested in the show for much of its runtime. The pacing of each episode is slow, with a self-serious, gritty tone. This could work wonders for the show, just as it did for “Homeland.” But that show had some multi-dimensional characters. Carrie Mathison’s bipolar disorder created compelling conflicts, both her internal struggle with her mental health, and her struggle to separate her paranoia about Nicholas Brody from the truth about him. Brody, too, was multifaceted, particularly with his struggle to hide his conversion to extremism during his time as a prisoner of war. The characters of “Ryan,” however, do not have equivalent dimensions to them. We never really see Ryan grapple with his mental health nor do we ever understand Greer’s anger and frustration with the world. The result is a show, that for much of its runtime, is uninteresting, slowly moving from cliché to cliché, treating each of them like the stuff of great drama. It’s a shame, because Krasinski and Pierce are otherwise compelling lead actors. As Ryan, Krasinski lends subtle anxiety to the role. With little more than a look in his eyes, he’s able to depict a man who’s already seen too much and is worried about seeing much worse. Pierce, too, deserves better material. He brings a certain gravitas and weight to Greer, but the character is so thinly written, there’s little that Pierce can do to make him compelling. It’s a shame; given the current political climate, a show with this kind of nuance could be really important. But, in its first two episodes at least, “Jack Ryan” is mostly a bore. There’s hope it’ll get better, either later in the season or in season two. Otherwise, this globetrotting spy adventure lacks the depth needed to be truly intriguing. Henry Spiro can be reached at hspiro@wesleyan.edu and on Twitter @judgeymcjudge1.